The so-called â€œIran Nuclear Deal,â€� officially known as the Joint Comprehensive Plan of Action (JCPOA) signed on 2015 now under threat by a backtracking US â€“ was billed at the time of its signing as a historic agreement that provided a path forward towards peace between the US and Iran. The 2015 nuclear deal struck between Iran and six world powers â€“ the US, UK, Russia, France, China, and Germany â€“ was the signature foreign policy achievement of Barack Obamaâ€™s presidency. The initial framework lifted crippling economic sanctions on Iran in return for limitations to the countryâ€™s controversial nuclear energy programme, which international powers feared Iran would use to create a nuclear weapon. But while the agreement has been hailed as a â€œsignature foreign policy achievement,â€� it was, before even its inception â€“ not a vehicle towards peace â€“ but a cynical ploy to justify future war. Do you know who the single biggest donor was to any candidate in the 2016 presidential race? Hillary Clintonâ€™s massive $1.2 billion losing campaign budget might make you think that it was one of the many, many powerful influencers who were looking to get on her good side prior to her anticipated coronation, but it wasnâ€™t. The largest donor to any campaign was oligarch Sheldon Adelson, who gave $25 million to the Trump campaign, and who in 2013 said that the US should drop a nuclear bomb on Iran. After his election win, Adelson gave another $5 million to Trumpâ€™s inauguration, the largest single presidential inaugural donation ever made. Newt Gingrich, another of the billionaireâ€™s hired politicians, has said that Adelsonâ€™s â€œcentral valueâ€� is Israel. Last week Israeli Prime Minister Benjamin Netanyahu, another Adelson lackey, made an absurd and dishonest presentation arguing in favor of the termination of the Joint Comprehensive Plan of Action, also known as the Iran nuclear deal. Today, Trump pulled out of the nuclear deal and announced aggressive new sanctions against Iran, like a good little boy. Lobelogâ€˜s Eli Clifton has published an article on how two other pro-Israel, anti-Iran oligarchs, Bernard Marcus and Paul Singer, helped pave the way for this decision along with Adelson. If you want to know what policies a politician will take seriously, ignore his campaign rhetoric and look at his largest sponsors. In his statement on the decision to pull out of the deal, Trump repeated the brazen, demonstrable lie that Iran is the worldâ€™s â€œleading state sponsor of terrorismâ€�, a lie again repeated on his Twitter account. The Veteran Intelligence Professionals for Sanity (VIPS), who have been consistently on the right side of history with every attempt by the US government to falsely manufacture escalations against noncompliant world governments, released a statement in December of last year explaining how this oft-repeated allegation is completely false, and that the actual leading state sponsors of terrorism are US allies. Yesterday VIPS addressed another memo to the president describing the deceitful nature of the Netanyahu dog and pony show and explaining why itâ€™s a mistake to pull out of the Iran deal. Trump also called the Iran deal â€œone-sidedâ€� in favor of Iran, when if anything the opposite is true, and said Iran obtaining nuclear weapons would trigger â€œa nuclear arms race in the Middle Eastâ€� as though Iranâ€™s top regional enemy doesnâ€™t already have nuclear weapons. 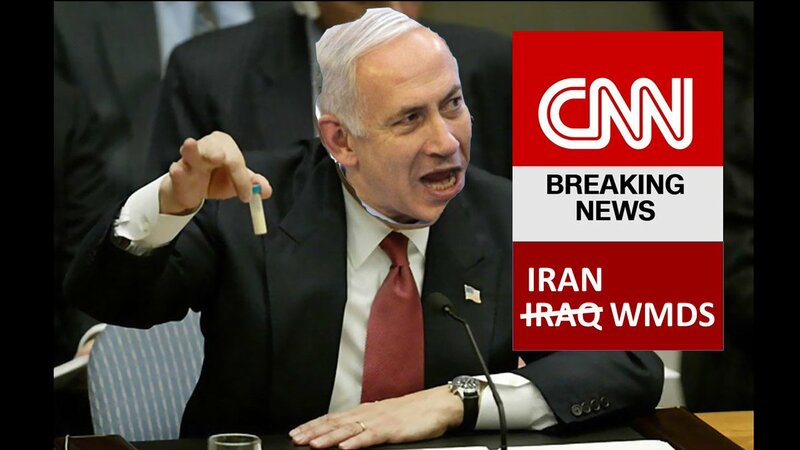 He referenced Netanyahuâ€™s presentation as though it had revealed damning new information, when in fact it did not. Iran is in full compliance with the JCPOA, and we are being lied to by yet another US president about yet another Middle Eastern country. Last Wednesday (May 09, 2018), the intel insider known as "Zach" was able to squeeze in a surprising amount of critically important, anti-neocon points between mid-sentence interruptions. Alex: "Trump's starting to civerge from what he said he would do, unless you look at it like this: the deal, six years ago, was made by the Chairman of the Joint Chiefs, Dempsey, to block Obama turning the entire Middle East over to al-Qaeda and Isis, and our own military started working with the Russians to block the full takeover because most of the rebels -- ninety-plus percent -- were ISIS/al-Nusra/al-Qaeda. And the deal was that Iran would then pull out, and that Assad would have elections once that was over -- and we first learned about this from Col. Shaffer and others and Tosh Plumlee -- and then years later it came out that that unofficial deal was made. So Trump could argue Iran is not pulling out, and that's what Israel said this week is that: you pull out, or we're going to start attacking you. So I'm not defending what Trump did, but it looks like that's the deal here, and some could say -- Israel is saying through unofficial sources -- that Iran was readying offensive missiles and pointing them at Israel. My issue here is: shouldn't we just have sanctions on Iran, shouldn't we go that direction? This immediate escalation is beyond saber-rattling. And then how does Korea play into that equation? How much of this is ahead of the Korean deal, with Trump making statements like: 'The United States no long makes empty threats.'" Zach: "Yeah, well, let's just get one thing clear: not offensive missile movement, that would be completely defensive missile movements. Iran is not perpetuating anything. Listen, I'm not pro-Iran, but...they're getting ready for Gaddafi 2.0, they're getting ready for Iraq 2.0. If you were them you'd be doing the same thing there. But here's the thing: they all say 'trust the plan.' The 'plan' was 'lock her up,' not keep it up when it comes to the military-industrial complex. This is a problem....I've got a real problem with perpetuating military-industrial complex building, meanwhile [Rashad] Hussain, Human and Hillary are chilling with Richard Branson. Lock her up, not keep it up -- that was the plan. So they want to talk about 'the plan,' this and that, this is ridiculous. Saudi Arabia had everything to do with Vegas, had everything to do with 9/11, and now all of a sudden -- because they are a high-profile client, they are the highest bidder -- we're going to just lay in bed with them? I've got a big problem with that, because that's not why I elected you, that's not why we elected you, and make no mistake: you work for us." Alex: "Well, Trump said he does what he says he's going to do, and so far, as presidents go, I haven't seen any president in modern history that has followed through on what they said as much as Trump. But on foreign policy he's breaking...If he starts breakin on this, what else will he break on? We'll see if Iran comes to the table. We'll see if carrying a big stick and being very, very clear makes them start to back down. I don't think that's enough for Saudi Arabia. Like you've said, they're going to want a wider war, they want to get their foot on the neck of Iran, and it's not going to happen." If you heard today's barrage of neocon talking points about Iran, you know why I'm bumping this thread.